Anticipation is half the fun! 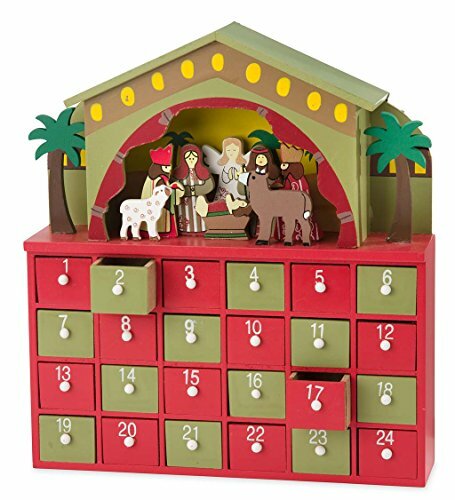 Welcome the holiday season with our pretty wooden Nativity Advent Drawer decoration. Painted in Christmas colors, this chest marks the exciting lead up to Christmas with a screen and hand painted 3-D tableau of the famous story of the nativity. Pop a treat into each of the 24 tiny drawers and let the countdown begin! Nativity Advent Drawer measures 9¼"W x 2¼"D x 10½"H, and will be a striking centerpiece for holiday decor. Size: 9¼"W x 2¼"D x 10½"H.